While the watch industry likes to promote “novel ideas,” they are just as susceptible to producing formulaic items as the film industry is. One formula that seems to work on paper is the marriage of a high-end watch brand and high-end automobile maker. What could make more sense? Combine a watch people love with a car people love to drive. Maybe it makes for the perfect driving companion? Or Perhaps the perfect lifestyle companion? It doesn’t matter as long as it is popular. The problem however is that while this idea works on paper, it has rarely worked in implementation. What you see here is one of the only really successful car/watch relationships in action. It isn’t clear how the relationship started but a few years ago Breitling came out with a new watch collection called the Breitling for Bentley. Even their logos were similar, and the concept combined the classic tool watch look of Breitling with the luxurious qualities of Bentley. 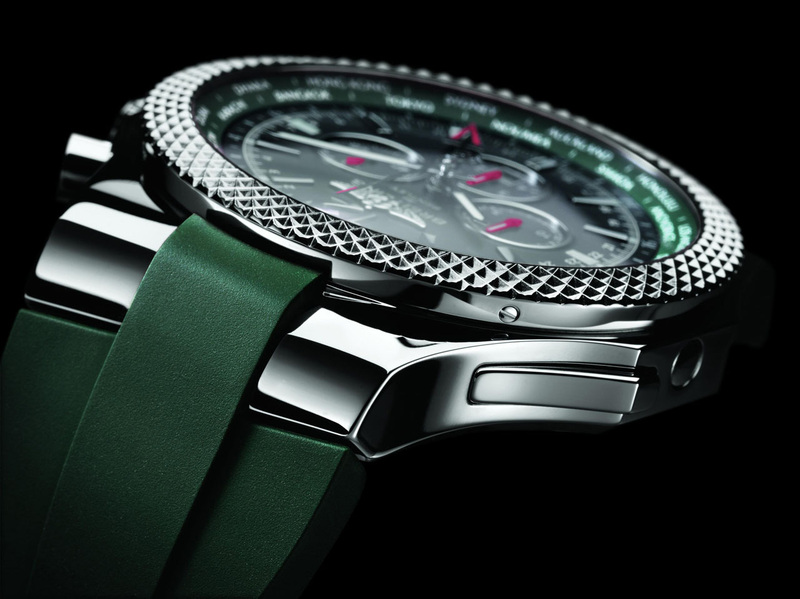 Each of the watches has a signature bezel meant to recall the look of Bentley grills. Dual branding on the dials was subtle with the less than bold “Breitling for Bentley” moniker. Practice has shown that bold dual branding on timepieces usually doesn’t work. A good model to represent the collection is this Breitling Bentley GMT timepiece. Let me first say that this is a big watch. I like big watches, but this one is for large wrists only. The case is 49mm wide with a very large lug structure. This heavy timepiece will over-power smaller wrists with its size. It comes in 18k red gold or steel on a rubber strap or steel bracelet. Inside the watch is a Breitling caliber 47B base Swiss ETA automatic chronograph movement. The movement has been expanded with a GMT complication module. Functions include the time, date, 12 hour chronograph, and 24 hour second time zone hand. Using the fixed flange ring city indicators you can also tell the time all over the world. The movement is further tested and given a COSC Chronometer certificate for accuracy. While Breitling branding is emphasized on the front of the watch, Bentley branding is emphasized on the rear of it. There you’ll find the Bentley name and logo at the top, with a note that the piece is “manufactured in Switzerland by Breitling.” Classy touch. The overall design of the Breitling Bentley GMT is a unique take on Breitling’s core look with some added distinction. Super bold in its execution, you should try one of these on first if you are interested in owning it.